My friends and I enjoy taking selfies. I enjoy science, and I thought what better way to bring the two together (like an exothermic chemical reaction!) 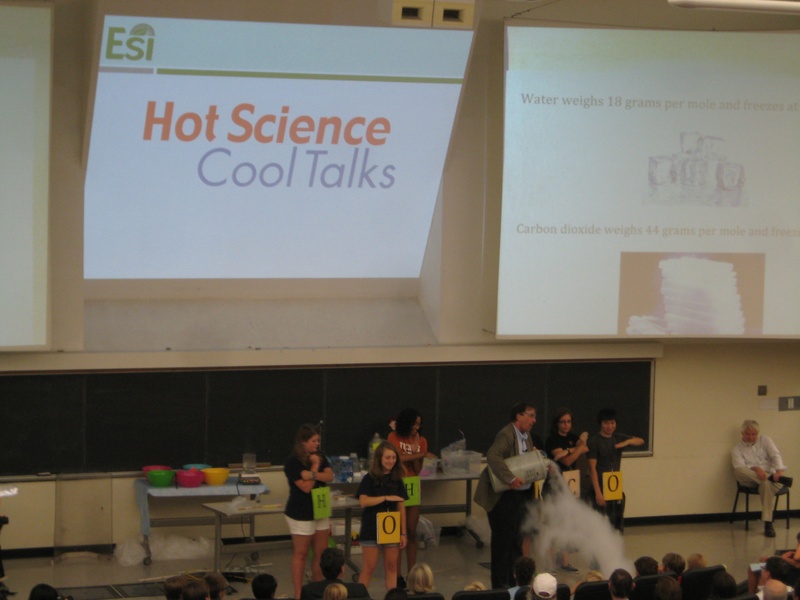 at last month’s Hot Science event about chemistry at UT Austin. 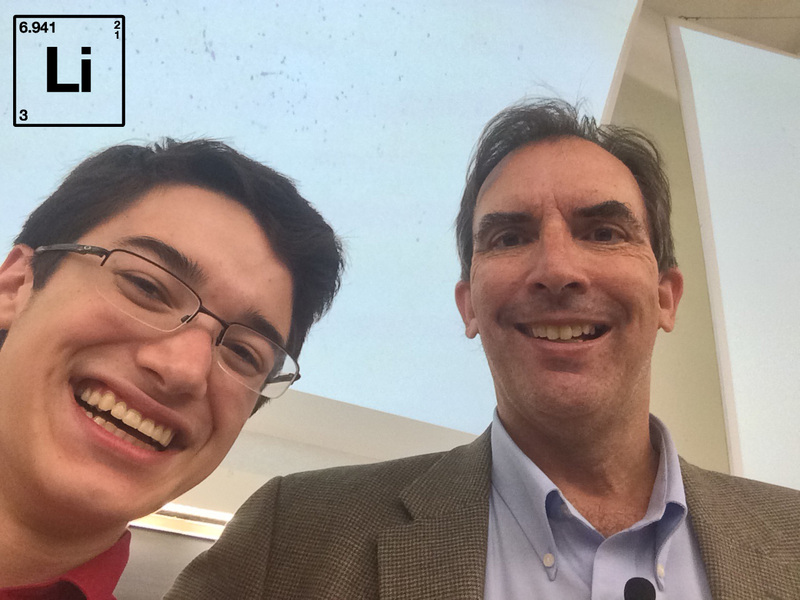 The first Hot Science – Cool Talk of the Fall 2014 semester, How I Learned to Love Chemistry, by Dr. David Laude was packed! There was a huge rainstorm before the event, but that didn’t discourage young and old chemistry enthusiasts from attending in force (F=ma). I think this is the most people that have ever been to a Hot Science event. If anything, the rain made people more determined to learn, especially with the pre-lecture activities. Everyone came out, including friends that I haven’t seen in years. The entire Welch Hall main auditorium was full with standing room only. What density (D=m/v)! Many people, including myself, a friend from school, and our chemistry teacher watched the event from the overflow auditorium. (I even arrived early!) Even with the time delay in the video simulcast, Dr. Laude’s talk was enlightening (c=2.9×10^8 m/s). 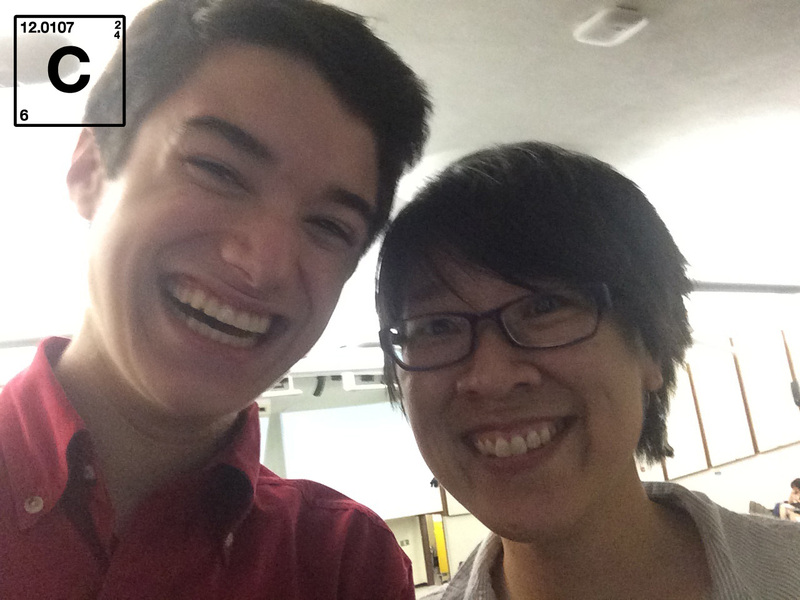 And now for the chemistry selfies! Dr. Jay Banner, Director, UT Environmental Science Institute (ESI), is the best! Dr. David Laude, UT Chemistry professor, gave a lively and interactive talk about chemistry. Loves to blow things up! Ms. Melinda Chow, coordinates fun events and activities for the UT Environmental Science Institute. 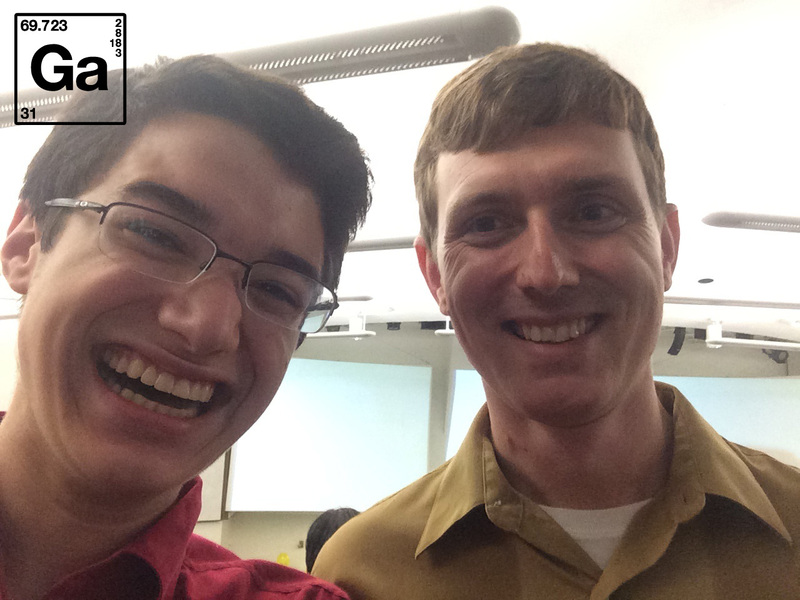 Mr. Patrick Goertz, my great chemistry teacher! 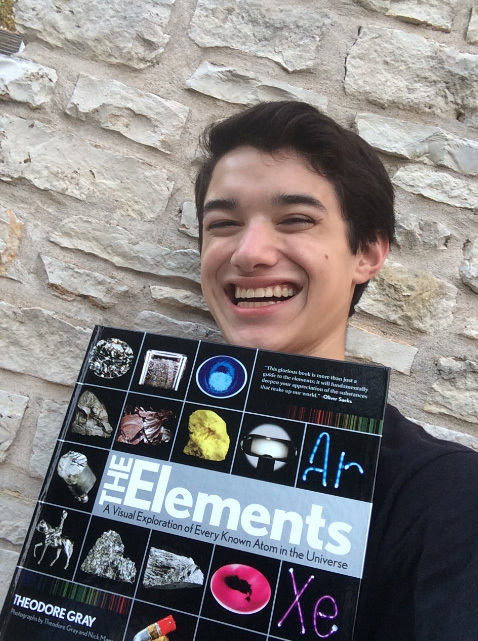 Theodore Gray’s The Elements book in print and on the iPad is an excellent and fun way to learn about the elements in the periodic table. I’ve used his book to learn more about the elements in my high school chemistry class. While I’ve enjoyed looking through the printed book, the app is more interactive and offers animations. To help dyslexic readers, I hope that the creators of the app, TouchPress, will publish an update that allows you to highlight portions of the text and use the iOS text-to-speech accessibility feature to have my iPad read the content out loud. 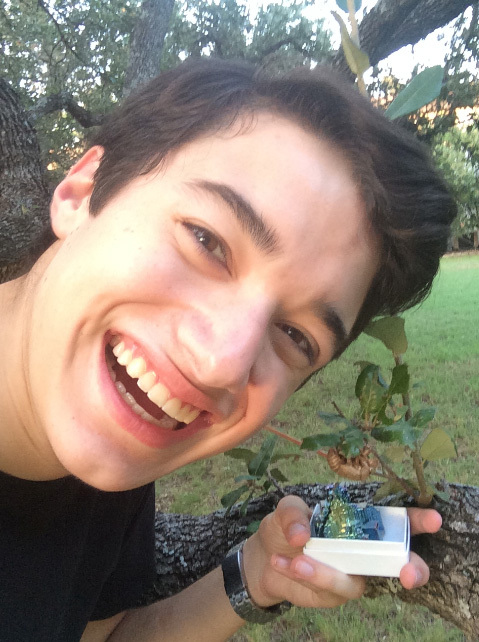 Bismuth (one of the most beautiful element structures), a cicada (at least its exoskeleton), and a live oak tree (Yea, biology!) wanted in on the selfies too. The next Hot Science presentation whirls in next Monday, October 6, 2014, with a special event at SXSW Eco. Dr. Kevin Klosel will talk about Extreme Weather and Uncertainty in Forecasting. Learn more about the future of hurricanes on the Texas Gulf Coast: Watch my video interview with Dr. Kerry A. Emanuel from a prior Hot Science – Cool Talks weather presentation. During this year’s SXSW Eco event, you’ll learn about the science behind extreme weather, like tornadoes and superstorms, and how meteorologists factor in uncertainty. 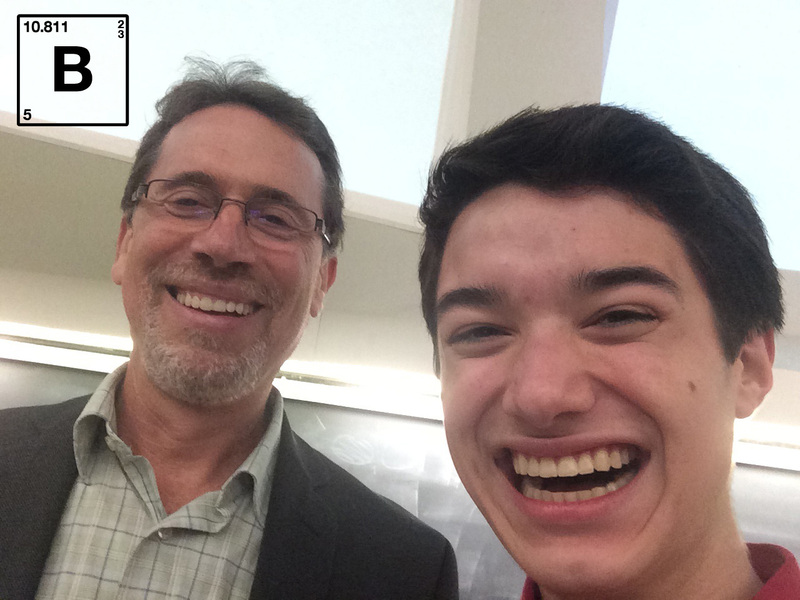 Sounds like another super Hot Science is on it’s way, and the forecast for selfies with Dr. Klosel are favorable! Update: Remember that this special event is free and is at the Austin Convention Center (and not at UT Austin.) The National Weather Service is bringing a tornado machine, and you’ll also be able to create lighting with a Van de Graaff machine and erupt snow to create an avalanche. Sounds like lots of fun!